Johnny Cooper, hero of early New Zealand rock’n’roll, died earlier this month in Lower Hutt, aged 85. Born in 1929, Cooper grew up on an isolated farm near Wairoa. He was gifted a ukulele by his uncle, who played saxophone in a Gisborne dance band. He began playing along to 78s, and would play in woolsheds to entertain the shearing gangs. Johnny Cooper in the early 1950s. Cooper stayed in a boarding house and got a job at Karori cemetery. On Sunday nights he sang at cinemas and suburban halls. He dug graves during the day, and met bass-player Willy Lloyd-Jones. In 1953 they formed The Ridge Riders with guitarist Ron James and Don Aldridge on steel. The group wore cowboy style outfits and became known at talent quests and live shows on radio, with appearances in Wanganui and at Linton and Waiouru. On Sundays they recorded in Alan Dunnage’s Island Bay studio, inside an old shop. A duet by Cooper became the number one 78 of 1954; Look What You’ve Done produced a double-sided hit. Cooper had written most of the song in a day: “I heard someone say ‘look what you’ve done’ and thought that was a crazy thing to say, that it would be good to sing something like that.” The song became a continual request for The Ridge Riders: “Shearing shed or anywhere, every party you went to in that period that was all you heard them play.” The song became a well-known Kiwi party song and was famously sung by Jake and Beth Heke in ‘Once Were Warriors’. 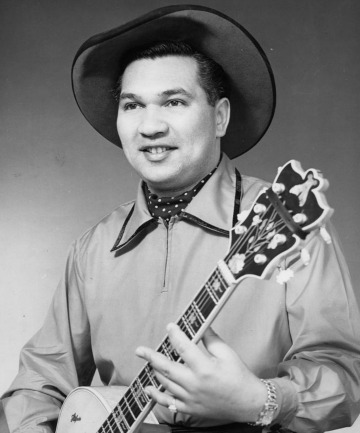 In 1955 Cooper started a solo career in rock’n’roll at town hall jamborees. He made New Zealand music history by becoming the first singer outside of the United States to record a rock’n’roll song when he recorded Rock Around the Clock with a group of Wellington jazz men at HMV’s Lower Hutt studios in 1955. As a country singer, Cooper had originally balked at the idea of recording a rock’n’roll track, and had said “What’s this rubbish? I’m not singing that.” Within a year Cooper was touted as the “undisputed king of rock’n’roll whose record sales are now far in excess of a hundred thousand.” Cooper also recorded New Zealand’s first original rock’n’roll song, Pie Cart Rock’n’Roll in 1955. Cooper’s musical talent saw him travel around the world, leading three concert tours during the 1950s to entertain Kiwi troops in Japan and Korea. In 1957, The Ridge Riders drifted apart and Cooper started holding talent shows around small towns, including Give It A Go! Through this, he coached some of New Zealand music’s well-known names, including rock’n’roll idol Johnny Devlin, Midge Marsden (who played in Bari and the Breakaways) and the Formulya, whose song Nature was to be judged the greatest New Zealand rock song of all time. Cooper, who was suffering from Alzheimer’s disease, died at his home early in September. Neighbours of Johnny Cooper knew him as a friendly pillar of the community, who tidied the area and mowed lawns for free. Friends knew him as a warm, modest and humble man, and hold many fond memories. Early rock & roll from New Zealand. Vol. 5 & 6. Pie cart rock ‘n’ roll : New Zealand rock ‘n’ roll 1957-1962. If you haven’t already, come along to the Central Library to see our Pixie Williams: The Voice of Blue Smoke display – it is looking (and sounding!) fabulous. To round up the display, we will be having a talk on Tuesday 1 October at 6pm. Chris Bourke, author of Blue smoke : the lost dawn of New Zealand popular music, 1918-1964, will be speaking on the significance of Pixie Williams and Ruru Karaitiana’s hit ‘Blue Smoke’; New Zealand’s first pop song. Come along and learn more about the iconic New Zealand track and the woman behind it, as well as the city at the centre of the song’s production – Wellington in 1948. October’s classical music picks feature a Spanish cello and guitar duo, some never before recorded New Zealand organs, a unique juxtaposition of Bach and Cage, and other quirky and exciting recordings that have recently graced our shelves! Listen to NZ musician Tama Waipara on our radio show podcast! Wellington City Libraries has a monthly radio show on Radio Access. For a recent show (27th November, 4.00 – 4.30) we interviewed Tama Waipara, singer/songwriter behind the 2009 release ‘Sir Plus and the Requirements,’ – a beautifully realised concept album rich in pop hooks and delicous arrangements. Tama talks generously about his inspirations, lyrics and songs and the 35 minute interview includes 6 songs from his 3 albums so far.